The earliest actors would portray different people by switching masks. Since Thespis in the 6th century B.C. people have donned masks or a persona, and pretended to be someone they are really not. Thus, actors today are called thespians, a reference to the man, and later the city named for him. 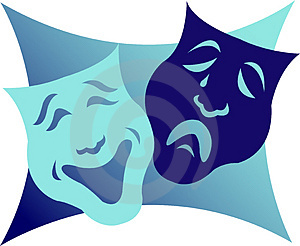 It appears to me that what many, if not most, of our churches do is make “/Thespians” instead of “Christians”. People are allowed to enter the church community by whatever rite or ritual particular to that group and then at once they are told to do this and don’t do that and in general how to act like a Christian. Some are very quick learners and catch on quickly. Others are not so successful and require more work to get their parts right and too often when the performance isn’t up to par they are simply ignored until they just go away. For most, once a week, and for others two or three times a week they come with the others to play their parts and then go back home to the reality of destructive behaviors like prescription drugs, too much drinking, etc., etc., trying desperately to fill the void that should contain a jest for life, love, joy, and peace. Why do we do it? Well, because we have been told that is how it is done. Daddy and momma and grandpa and grandma did it this way so that is the way it should be done. Really? Jesus encountered the same situation. The most religious folks in town, by community standards, were only actors, they were impostors. They used their masks well saying long public prayers with flowery words meant to be heard and appreciated only by them and the human listeners. They were quick to remind their neighbors of how religious they were, how pious, how carefully they complied with every church rule. Jesus described these religious actors as white washed tombs. They appeared good on the outside but inside they were corrupt and full of decay. Christ and his followers came offering a better way. Love God and love your neighbor. And, Jesus for 3 1/2 years showed people how to live, and how to love. It was Jesus on his knees washing the feet of his followers, including the one who would soon betray him into the hands of those who would execute him. Why would he wash Judas’ feet you ask? Because that is the way you love people, by serving them, doing what is best for them. But you say, “I can’t love people like that”. I understand. God does too. I can’t help you to love like that. He can, and He will. Jesus hung there abandoned by his friends and even by his heavenly Father for a time, in your place, paying the penalty due for your sins and for mine. He was taken down from the cross and laid to rest in a borrowed tomb. Three days later, just as he had predicted, he rose from the dead and after 40 days with his friends he ascended back to heaven and to the Father. Here is the good news. You are no longer condemned! You are no longer facing the penalty for the bad things you have done! Jesus paid your debt to God off in full! What should your response be? Just take Him at His word. Believe that Jesus died for you, that he was buried and was raised from the dead and love him back. He promises not only a new start for those who choose to believe on him but a new heart. He will supernaturally give you the ability to love even the unlovable, even your enemies! He will come in the person of the Holy Spirit to live with you and in you to empower you to say no to things you know you should avoid and to do what you know to be right. God says to each of us, “Do a U-Turn!”. Give up on your way of living and follow his way. Say it! He wants us to say to others we are now following him. Make it public! In the waters of baptism we reenact Jesus death, burial, and resurrection. Before witness we are saying I am identifying with Jesus and his true followers, I am dying to my old self and way of life and I am rising to follow only Him from this day forward. Start loving and living the new Life! Love God with everything you are and love your neighbors the best you possibly can. The way you love God or anyone is to do things that you know will please them and stop doing anything that does not please them. Just become a lover! You might ask “Is is that easy?” It is that easy…but, a word of warning. There will be some people who will not like you very much if you start living a life of love. Unbelievable but true. You might even have close friends or even family who will say you have gone nuts and they will avoid you. And, I promise you this too. Those actors at the church in town might not like you either. If you refuse to play the games, or put on the mask, and just love God and love people you might not be liked by the very people you would think should appreciate you. What exactly does God require to be a disciple of Jesus? Everything. Yes, everything. God loved you enough to die for you now love him back with everything you have. You might protest, “But I thought there were those long lists of does and don’ts, or can’s and can’ts. What about those?” Love takes care of all that. If you will choose to love God with your whole person, inside and out, those things will just become as natural as breathing. Don’t become an actor, hiding behind a mask. Say YES to Jesus’ offer and follow Him. I pray that you will. Oh, if you are one of the pretenders, drop the role and follow Jesus. Stop pretending and start living the abundant life of Jesus.